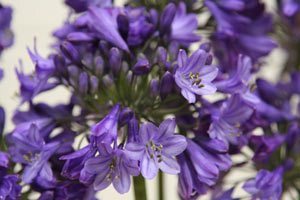 The deciduous Agapanthus campanulatus ‘Isis’ is a clump forming perennial with foliage to around 50cm, the flowers rising above on tall sturdy stems. This is a sun loving plant with good deep blue flowers from summer through autumn. Excellent in a sunny border with other perennials, also grows well in a container and can look great when in full flower. Remember Agapanthus ‘Isis’ will lose its foliage over winter, so plant appropriately. With long lasting flowers, this is a variety suited to growing in containers as well as in the garden border. A sunny position and a well drained soil is essential. Dig in some well rotted compost and manure before planting. Water in well with a liquid seaweed fertilizer and mulch lightly. Over time a clump to around 50 – 70 cm will form and this can be divided in early spring. Spent flower heads can be removed to ‘tidy up’ appearance after flowering. Flower colour – Violet Purple. Spread – Clump forming to around 50cm before requiring dividing.